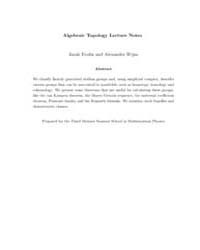 Description: This book explains the following topics: Some Underlying Geometric Notions, The Fundamental Group, Homology, Cohomology and Homotopy Theory. 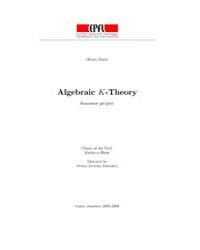 Description: This book explains the following topics: The fundamental group and some of its applications, Categorical language and the van Kampen theorem, Covering spaces, Graphs, Compactly generated spaces, Cofibrations, Fibrations, Based cofiber and fiber sequences, Higher homotopy groups, CW complexes, The homotopy excision and suspension theorems, Axiomatic and cellular homology theorems, Hurewicz and uniqueness theorems, Singular homology theory, An introduction to K theory. 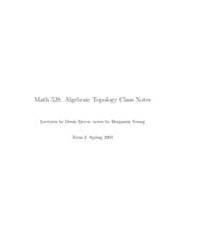 Description: This note covers the following topics: The Fundamental Group, Covering Projections, Running Around in Circles, The Homology Axioms, Immediate Consequences of the Homology Axioms, Reduced Homology Groups, Degrees of Spherical Maps again, Constructing Singular Homology Theory. 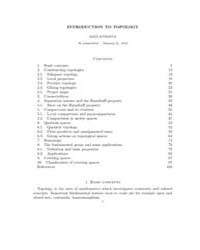 Description: This book explains the following topics: the fundamental group, covering spaces, ordinary homology and cohomology in its singular, cellular, axiomatic, and represented versions, higher homotopy groups and the Hurewicz theorem, basic homotopy theory including fibrations and cofibrations, Poincare duality for manifolds and manifolds with boundary. 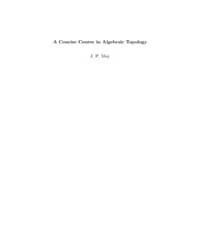 Description: The first half of the book deals with degree theory, the Pontryagin construction, intersection theory, and Lefschetz numbers. 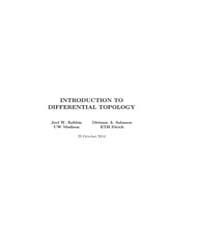 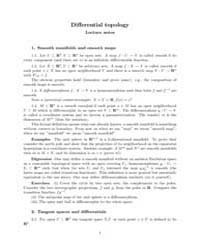 The second half of the book is devoted to differential forms and deRham cohomology. 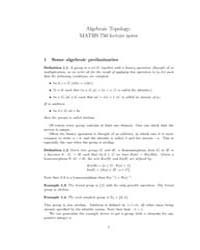 Description: Algebraic K-theory is a branch of algebra dealing with linear algebra over a general ring A instead of over a eld. 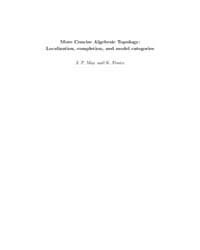 Description: This book covers the following topics: The Mayer-Vietoris Sequence in Homology, CW Complexes, Cellular Homology,Cohomology ring, Homology with Coefficient, Lefschetz Fixed Point theorem, Cohomology, Axioms for Unreduced Cohomology, Eilenberg-Steenrod axioms, Construction of a Cohomology theory, Proof of the UCT in Cohomology, Properties of Ext(A;G). 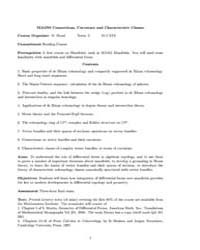 Description: This note covers the following topics: Group theory, The fundamental group, Simplicial complexes and homology, Cohomology, Circle bundles. 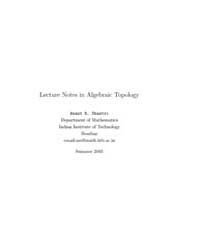 Description: This note explains the following topics: Cohomology, The Mayer Vietoris Sequence, Compactly Supported Cohomology and Poincare Duality, The Kunneth Formula for deRham Cohomology, Leray-Hirsch Theorem, Morse Theory, The complex projective space. 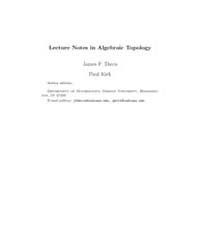 Description: This note covers the following topics: Chain Complexes, Homology, and Cohomology, Homological algebra, Products, Fiber Bundles, Homology with Local Coefficient, Fibrations, Cofibrations and Homotopy Groups, Obstruction Theory and Eilenberg-MacLane Spaces, Bordism, Spectra, and Generalized Homology and Spectral Sequences. 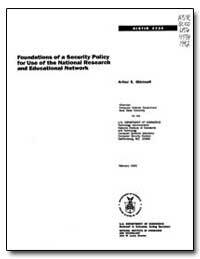 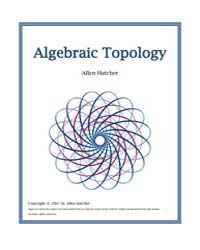 Description: This book explains the following topics: Basic concepts, Constructing topologies, Connectedness, Separation axioms and the Hausdorff property, Compactness and its relatives, Quotient spaces, Homotopy, The fundamental group and some application, Covering spaces and Classification of covering space.